On Monday morning, June 21, 2018, more than 400 workers of Iran National Steel Industrial Group in Ahvaz once again called for the consideration of the status of the company and the payment of their delayed salaries in a gathering in front of the Governorate in Ahvaz. #Iran: Protest gathering of the National Steel Industrial Group workers. 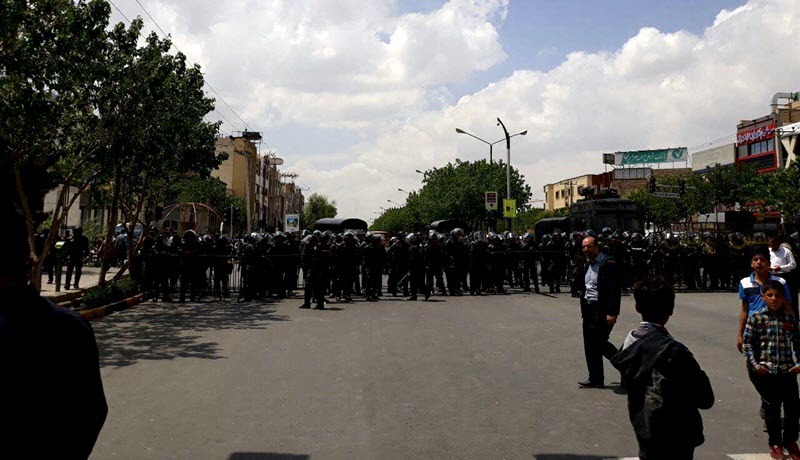 After the gathering at the Ahvaz Governor building, the employees of the steel company then headed to Kianpars and marched to Mahin Street while being surrounded by police forces and police cars along the way. On Monday, June 11, 2018, a group of drivers from the Tehran Bus Company, a member of the Spidar 2 and 3 housing project team in Tehran’s Sepidar Housing Cooperative, protested to the five years delay in the delivery of their homes. The police, who were trying to silence the protesters with promises, were only faced with more objections and complaints from the drivers. The Sepidar 2 and 3 projects, with 270 members, were launched from the 2010 and 4 blocks of the project should have been completed within 36 months and delivered to its owners. But after five years from the time it was announced, the project has not been completed yet, and no unit was delivered to Tehran Bus Company employees who were registered to receive their houses, and the project was left half completed. 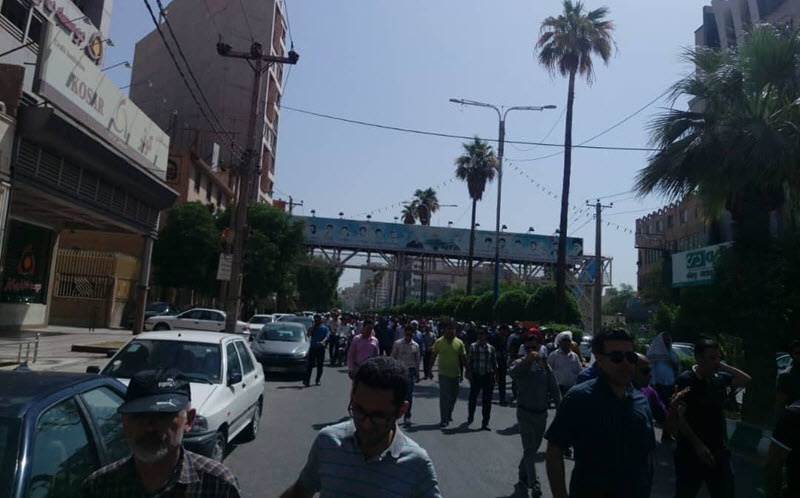 Following several days of protests, the people of Shadegan city rallied on Monday morning, June 11, 2018, in protest against their unemployment in front of the entrance door of the Farabi Cultivation and Industry Corporation in Khuzestan Province, Iran. The protest against unemployment situation of the people in Shadegan has taken place while, according to the plans approved by the provincial and district technical committees last year, the Shadegan’s employment per capita from the Rural and Inclusive facilities was reported to be 721 million rials. During the protest rally in the city of Shadegan on Monday, repressive forces were deployed and present at the location and arrested a number of protesters who were in need of work. 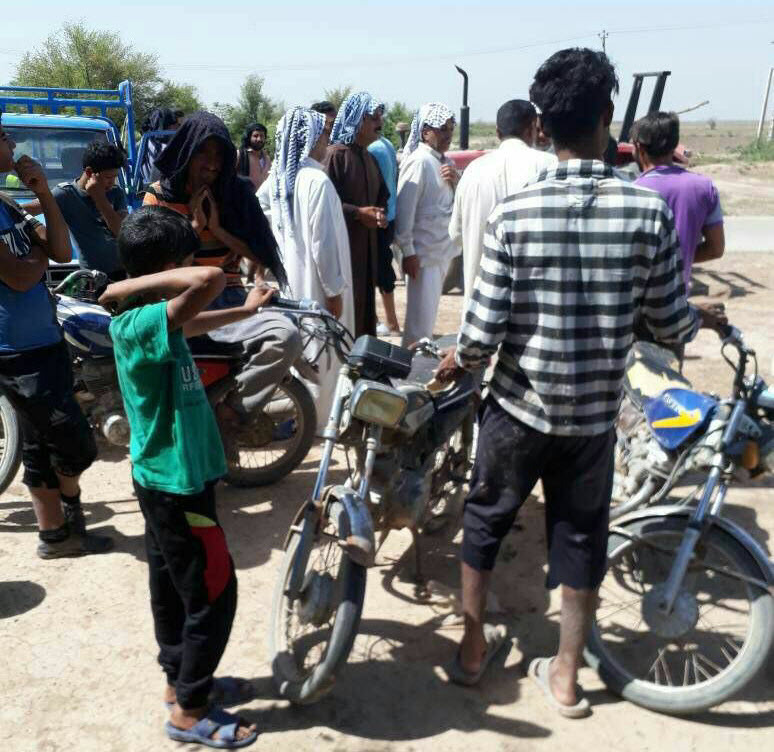 On Monday, June 11, 2018, a group of farmers on the banks of the Dez Dam rallied in protest of the lack of their water rights from the Iranian government and the collection of motor pumps that belonged to these farmers. Farmers on the banks of the Dez River had previously protested to the ban on cultivation by government agents and the shutdown of water pumps in the villages by the water and power company. Following this incident, a number of farmers gathered with shovels and other agricultural tools to protest the prohibition of cultivation on their lands. Dez Dam located in Khuzestan province of Iran and one of the reasons for the water crisis in this region is the progressive increase of deep and illegal wells which results to the the excess consumption of groundwater aquifers in the agricultural sector making it hard for farmers to cultivate on their lands. Customers from the Kerman Motor, which attempted to sell cars last February, gathered on Monday morning June 11, 2018, in front of the company’s building in Tehran to protest against the company’s scam in not delivering they bought vehicles to the customers. Kerman Motor, one of the oldest and largest automobile assembly companies in the country, is a corporation that can be named as Iran’s largest car assembly after Iran Khodro and SAIPA. In the early morning of Monday, June 11, 2018, a number of people in Borazjan gathered in protest against the lack of water in front of the Water and Wastewater Company in Bushehr province, Iran. The heat of the air and the lack of water in Borazjan has become irritating to the people of the city and the water department of the city has done nothing to solve the problems of people. Furthermore, the heat, the Ramadan fasting, and the lack of water continues in the Bushehr province, especially in Dashtestan and Borazjan, and people are still protesting. The people of Borazjan gathered in front of the water and wastewater department of Borazjan on late Sunday night to early Monday morning and blocked the streets with their motorcycles and protested to the several days of lack of water. PMOI/MEK,7 May 2018— Iran witnessed 452 protest rallies throughout the month of April, meaning a daily average of 15 rallies staged by credit firm clients, farmers, merchants, students, workers and other branches of the society. Economic pressures and the Iranian regime’s repressive policies were the main focus of these gatherings, marking an increase in comparison to March. Continued protests surged in April, in addition to women and the youth overcoming all odds to take part in most of these protests. 39 rallies organized in 13 cities were staged by credit firm clients demanding a return of their savings. Women are especially playing a significant role in these rallies as people are protesting state entities literally robbing them of their savings. Protesters in several cities were even seen resorting to throwing various objects at credit firm branches across the country. On April 7, retirees in two different cities held rallies protesting the retirement age in Iran and authorities’ refusal to respond to their demands. For years these retirees have been deprived of a variety of services, retirement funds and pensions. The protesting retirees are also seeking a unified retirement plan and no discrimination imposed by the relevant authorities. In April, eight cities were host to 16 different protest rallies by college students. supporting a general strike launched by store-owners and bazaar merchants of Iran’s western and northwestern provinces. Teachers held eight gatherings in five different cities across the country throughout April, protesting authorities’ refusal to provide their delayed paychecks. There are teaches who have not received their paychecks for more than a year. A detained teacher by the name of Mohammad Habibi was released as his colleagues continued their protests and left the authorities no choice. 109 labor protests in a span of 47 cities, commercial complexes and industrial towns throughout the month of April. This is tantamount to nearly four labor protests each day. Paycheck delays, work dismissals, unemployment, the arrest of colleagues, their job conditions remaining an uncertainty, and employers’ practice of recruiting non-locals were all subjects of labor protests in April. At midnight of Sunday, April 15, 2018, suppressive forces attacked houses of Khorasgan people in Isfahan in order to prevent the spread of protests and demonstrations by farmers and people, and arrested a number of farmers and youths in the city. Throughout the day and night, repressive forces had an intense presence around the city in an effort to intensify the atmosphere of fear and intimidation. The anti-riot mercenaries also moved toward the city in 20 cars and four buses to stop the demonstrations of the people of Varzaneh. farmer dies, but does not accept humiliation; we are the women and men of battle, we get back our right to water…. – People from the village of Jofair in Hoveizeh (in Khuzestan province) held a protest rally and called for the right to use the drinking water of Jofair Project. 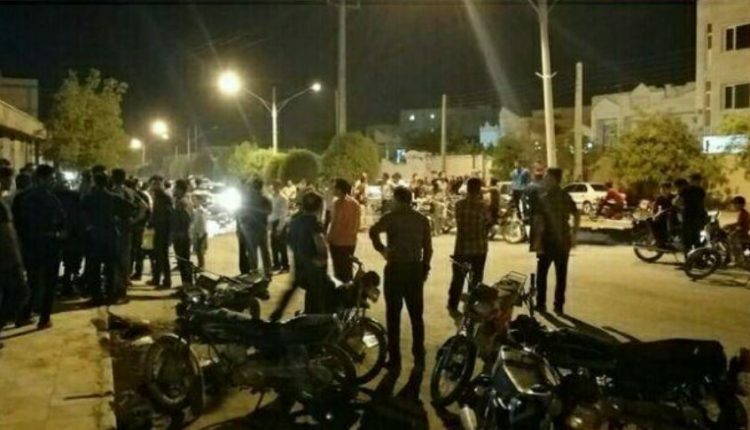 – A group of people looted by the Arman Vahdat governmental institution in Ahvaz gathered in front of the Shariati Branch and demanded the return of their deposits. The protesters finally blocked door of the institute with mud. In Shushtar, the looted people of the same institute, in a protest move, expelled the employees from the building and closed it. – In Mashhad, the people looted by Caspian institute held a protest rally outside the Pamchal branch in Sajjad Boulevard. The protesters, while carrying a placard, called a big lie the claim of Rouhani that he has resolved the problem of 98% of the depositors. They carried another placard, which read: What is the behind the scenes of the Caspian Institute, which none of the officials and three branches do not dare to, expose and follow up? – In Yazd, health centers’ personnel protested in front of the governorate against the failure to pay salaries for several months and lack of job security. – In Tehran, students at Tarbiat Modarres University protested against the illegal evacuation of dormitories, renting university facilities (gyms, swimming pools, etc.) to earn money, and looting the University’s budget. – In Yasuj, families of victims of passenger airplane that crashed gathered in front of the Red Crescent building in protest against the inaction of the regime’s officials for finding the bodies of the dead, and called for the delivery of their loved ones bodies. On February 18 last year, an airplane of Asman airlines with 60 passengers and six crewmembers crashed near Semirom, Esfahan, and all its passengers died. The clerical regime did not make any effort to save the passengers of this plane, and now it refuses to take any action to find the bodies of the dead. – In Tabriz, fans of the Tractor-Sazi team chanted slogans in Turkish against Ajorlu, the executive manager of the team who is one of the agents of the regime’s repressive organs. They protested against the atmosphere of repression against the team and its supporters and chanted: Take your herd and go; the Azerbaijani people do not accept humiliation; the protesters protest against the continued use of the special unit to suppress the fans of Tractor-Sazi team. – On Saturday, April 14, 2018, the teachers of the educational services purchase plan for the second time gathered in front of offices of Ministry of Education in protest against the nonpayment of their outstanding salaries. Protesters gathered in various cities, including in Qazvin, Kerman and Yazd, demanded full insurance and equalization of their salaries with official employees. The youth continue expressing their anger and hatred against the corrupt and suppressive system of the Velayat-e faqih (The Guardianship of the Islamic Jurist) by burning Khamenei’s ominous images and writing graffiti on walls such as burning of a large banner of Khamenei in the northwest air defense base in Tabriz, which is a completely protected area, and also in Yasuj. Courageous youth also commemorated the martyrs of Ashraf by installing images of them who were killed during the regime’s criminal assault on Camp Ashraf on April 8, 2011. 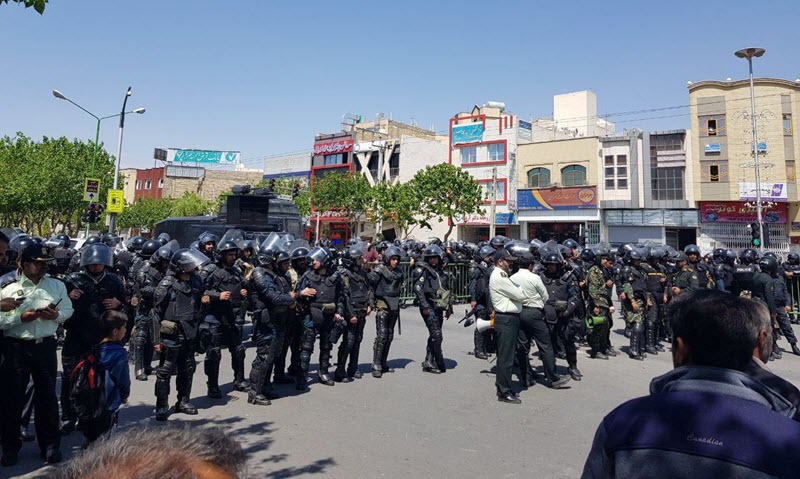 From the morning of Thursday, April 12th, the farmers demonstrations in Isfahan and protests by teachers in Kerman, Shiraz students, looted people in Mashhad, the unemployed in Bushehr and … are taking place. Farmers in Isfahan today, in addition to insisting on the return of their water rights, called for the immediate release of those arrested on the previous day’s demonstrations. 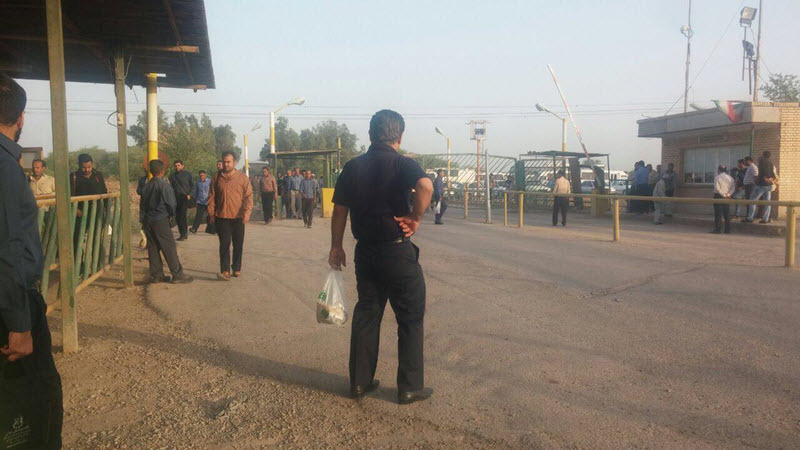 On Wednesday, April 11, the expelled workers of the Ilam refinery demonstrated their poverty in a protest movement by spreading an empty table at the entrance to the refinery. Also on Tuesday, a group of workers in the refinery gathered in protest of non-payment of their claims. They called for job security and the return of their fired colleagues. On the same day, farmers in the city of Rudbar Jonoub of Kerman, who plant tomatoes in the Jazmourian wetland, closed the Rudbar-Jazmoryan transit road for the second consecutive day in protest of the low tomato prices and the loss of their one-year work. In Qazvin, workers of Iranian Metal Powder Corporation gathered in front of the governorate in protest of the failure to pay their salaries. The workers carried placards, which read: our New Year gift this year: expulsion, unemployment, poverty. In Bandar Abbas, the workers of the municipality gathered in protest against the nonpayment of their salaries for several months. Taxis drivers staged a protest gathering outside the governorate in Orumiyeh. The Revolutionary Guards have caused their unemployment and heavy loss by launching ‘internet taxi’. The taxi drivers of the Azimyeh Karajon Wednesday, and the taxi drivers of Sanandaj on Tuesday also staged gatherings in protest at deterioration of their living conditions. In Ahvaz, the people looted by the Arman Vahdat Institute staged a protest gathering in front of a branch of this institute at Shariati Avenue. They chanted: What have done those behind the scene with our money? 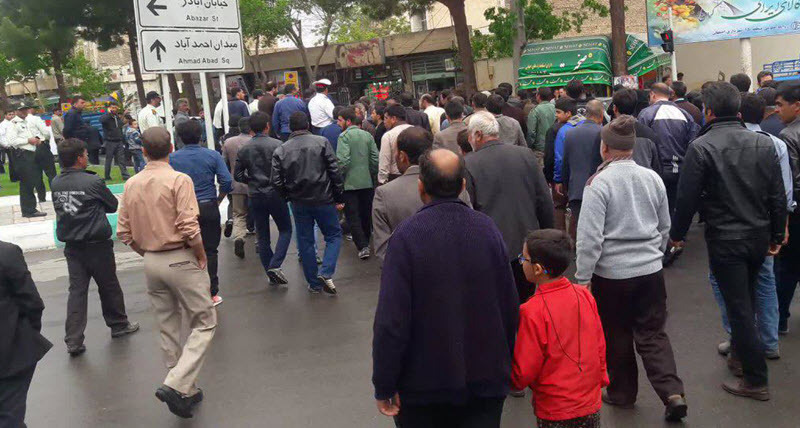 On Tuesday, April 10, Kazerun residents gathered in front of Kazerun governorate for the second day in protest against the division of the country and the separation of some parts of the city. On the same day, a group of teachers and educators from the Khark island gathered in protest at cutting off some of the services by the oil company. The workers of the Jam-e Jam printing house in Sari, who had become unemployed due to the closure of the factory and lacked the lowest level of job security, gathered in front of Mazandaran governorate. Writing graffiti and posting leaflets on the walls in Tehran and other cities are continuing. In Tehran, this slogan is seen on the walls: “The prayer of every Iranian is the overthrow of this regime.” It is written on a wall in Jayhoun Street: “A dollar equals 6000 tomans; Khamenei is despicable.” In Boroujerdi Square, it is written in Turkish: “Long live freedom, death to Khamenei.” In Kashan, leaflets saying “Death to Khamenei and Rouhani, death on the principle of Velayat-e faqih was posted on walls in different neighborhoods.